Our classes are taught using a wide variety of contextualized curricula that Motheread, Inc. has developed with input from scholars, education experts, and researchers to help us make instruction relevant, meaningful and effective for students at many different stages of their lives and their learning. We know that, for programs to work, they must build on students’ strengths and hopes. Our research-based curriculum gives programs new ways to make skills, as well as dreams, a reality. To accomplish this goal, Motheread, Inc. develops a variety of literature and history-based curricula. During a multiyear process, a combination of scholar research and advice, field analysis, practitioner and community leader focus groups, and pilot testing are combined to create award-winning curricula. All lessons in each adult curriculum provide a meaning-based approach for comprehension skill development, allow teacher flexibility to individualize instruction and meet students’ personal goals, promote group learning for social support and self-efficacy, and contain multiple opportunities for students to practice skills. 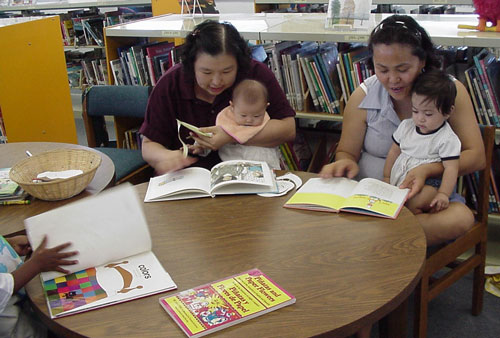 Each of the children’s lessons builds vocabulary and promotes higher-level comprehension skills, follows an intentional and focused process that incorporates conversation and activities with book reading, provides interactive literacy materials to use with parents and children together, encourages children to link prior knowledge and real-life experience to book reading, and supports federal emergent literacy instruction guidelines. © 2014 Copyright by Motheread®, Inc.. All rights reserved. Motheread, Motheread/Fatheread, Story Exploring, Story Extenders, Birth and Beginning Years. B.A.B.Y., F.a.t.h.e.r., Fathers Acting to Heal, Educate, and Reconnect, Teacheread, Literacy Instruction for Everyone, Life, My United States and their logos are trademarks of Motheread, Inc.